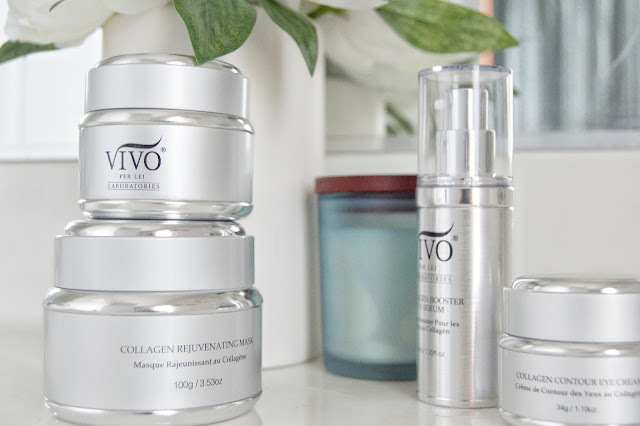 Featured is the Collagen Collection by Vivo Per Lei Laboratories. I have had the pleasure of making this my before bed regime for the last eight days. It did not take long until I could see a difference. I will include exactly each products purpose. My review will be below. I have also included a 30% off code below!! First, most of you know Landon and I have been playing flu tag for a month now. Yesterday, (after another trip to urgent care) Chris let me go upstairs, listen to some soft music, and just unwind. I poured myself a glass of wine and took his offer in a split second. "Reduce the appearance of sagging skin with the Collagen Rejuvenating Mask from Vivo Laboratories. This luxurious facial mask is formulated using Copper Amino Acid Chelate, Aloe Vera, Chamomile and Soluble Collagen to give your skin a more supple look and feel with red carpet-worthy luminosity"
I added an extra five minutes to apply the mask to as evenly as possible. After wearing the mask for ten minutes I rinsed my face with warm water and allowed my face to dry before the next step. 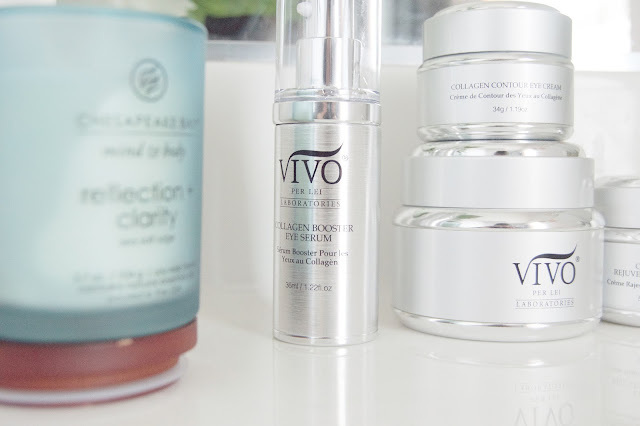 "Diminish the appearance of fine lines and crepiness in your eye area with regular use of the Collagen Booster Eye Serum from Vivo Laboratories. Formulated with Palmitoyl Tripeptide-1, Soluble Collagen, Hyaluronic Acid, Palmitoyl Tetrapeptide-7 and Vitamin A, this lush eye cream absorbs easily, diminishing look of premature aging and leaving your skin with a more refreshed and moisturized feel." "Deliver a smother appearance to your eye area with the Collagen Contour Eye Cream from Vivo Laboratories. 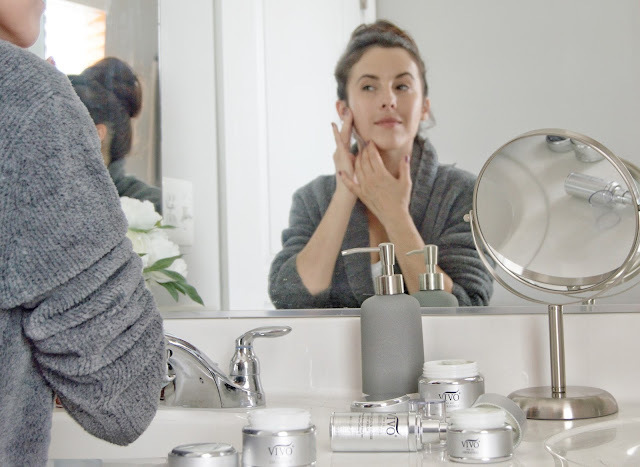 This under-eye cream is infused with Soluble Collagen, Shea Butter, Vitamin C, Vitamin A Retinyl Palmitate and an array of anti-aging peptides to present a tighter and more rested look and feel to your eyes." By this point I already noticed a difference in my appearance. My skin began to look hydrated and recovered. 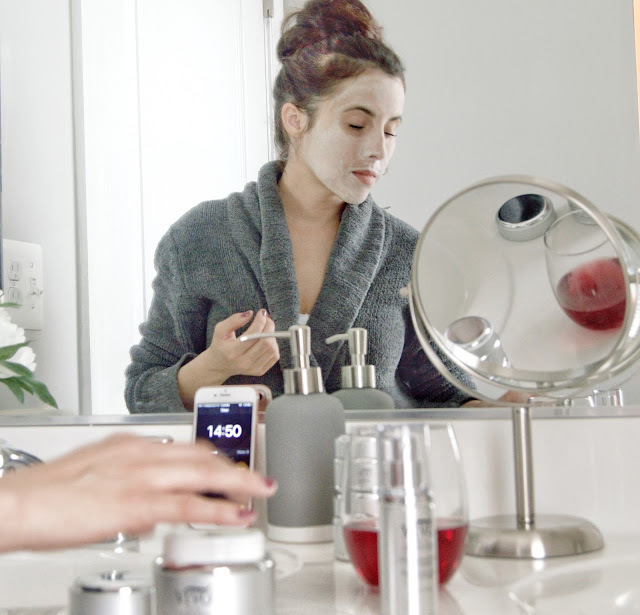 I took my next sip of wine and allowed my skin a moment to soak up any non-dried areas. 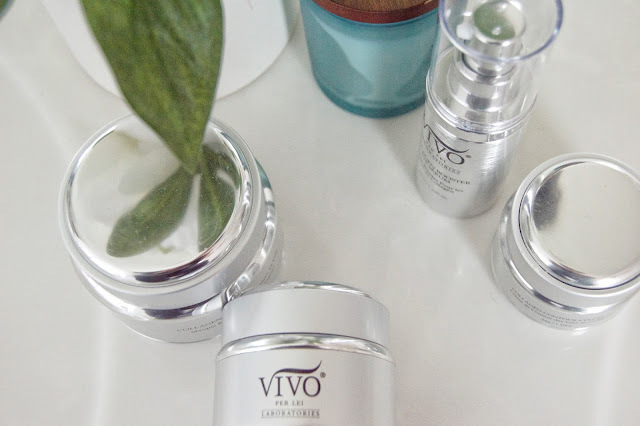 "Formulated with ingredients like Soluble Collagen, encapsulated Caffeine, Vitamins A and C and anti-aging peptides, the Vivo Laboratories Collagen Rejuvenating Cream helps restore the radiance of youth to your appearance as your skin is made to feel smoother, softer and more energized." This was the icing on the cake, the cherry on top, aka the best part. I applied by gently massaging in a circular motion over my entire face and neck. A small amount went a long way. I can tell this entire collection will last me quite some time. CLICK THIS LINK HERE TO PURCHASE TODAY!!! Use code: Roulette for 30% OFF!!! All opinions are 100% my own and this is my honest review.